The Barbados Unit used the CARDI Day platform to showcase the achievements under the Coconut Industry Development for the Caribbean project. 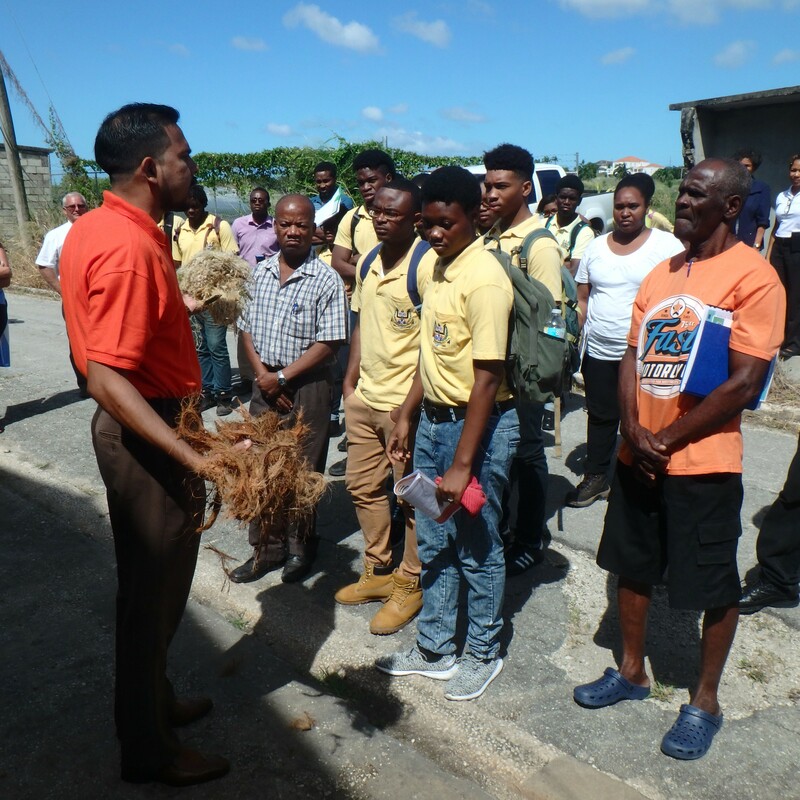 Representatives from the donor community, partners, and other agricultural stakeholders gathered at the CARDI Demonstration and Training Centre in Graeme Hall, saw first-hand how the project has assisted in revitalizing Barbados’ coconut industry. Improving production was one of the major objectives of the project and to this end two nurseries with a combined capacity of producing over 3,700 seedlings were established. Visitors got the opportunity to tour the nurseries where they saw two contrasting systems for seedling production. Improper disposal of discarded shells from coconut vendors is a problem authorities in Barbados are seeking to bring under control. Through the project a shredder was procured and its use demonstrated. CARDI Representative, Ansari Hosein spoke on the sustainable use of the shredded material. A mini exhibition demonstrating a range of coconut value added and by products were also on display. Chairman of the National Coconut Stakeholders Platform, Michael Gill called for a measure of regulation and organisation to the business of coconut vending, including registration of farmers, vending villages along the highways and better practices and monitoring to ensure proper food safety. Bringing remarks on behalf of the EU Delegation in Barbados was Programme Manager, Katja Svensson, who revealed that a second phase of the coconut project will be financed to a tune of 6 million Euros. She noted that it will build on the first phase of the project and said activities will focus on the development of coconut nurseries, evaluation and multiplication of varieties to increase coconut production efficiency, coconut waste management and the promotion of climate-smart practices. The Honourable Indar Weir, Minister of Agriculture and Food Security thanked CARDI for its regional research programme and noted how pleased he was with the achievements of the project’s activities in Barbados. He requested the Unit collaborate with the Ministry to design and implement climate-smart agriculture practices and the rebranding of agriculture primarily among school children.